After you click over the Sign In / Register button, the Sign In dialogue box/form will be displayed. Click on “Sign up” to register. 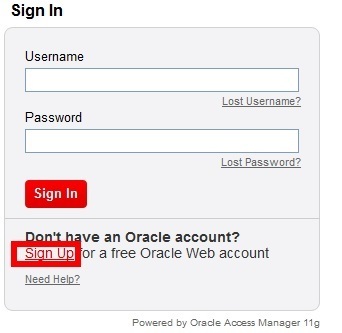 After you click on the “Sign Up” link, you will be asked to fill out the “Create Your Oracle Account”. Make sure you enter your valid email address as you have to verify your email address later on. After you input all the required information in the form, click on “Create” button. After sometime, you will receive a verification email from the Oracle ([email protected]). The subject of the email will be “Please Verify Your Oracle Account”. Open the email. In the email subject, the “Account Verification Link” will be provided to you. Click on the “Account Verification Link”. Sign in using the username (your email address) and password you used while creating your account and then you will be able to see the message that your account is verified. Now again visit https://edelivery.oracle.com/ and sign in using the username (your email address) and password. You will be asked to Agree to the terms and Conditions. Read them carefully and if you have any doubt, you can contact Oracle. If you agree to all the terms and conditions given in that page, check the two check boxes and then click on the Continue Button. In the next step, you will be asked to select application. 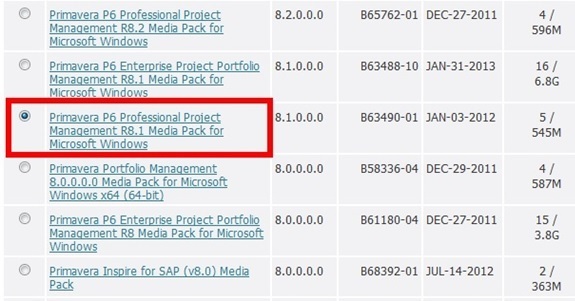 Select the Primavera Application and select the Platform you are using. Make sure you select the correct platform (you can get information regarding your platform from the Computer Properties). Click on “Go” button.